One of the most common causes of numbness and tingling of the fingers and hands is carpal tunnel syndrome. Carpal tunnel syndrome (CTS) is caused by compression of the median nerve as it enters the hand at the wrist. The median nerve arises from the spinal cord in the neck and travels down the length of the arm. The nerve provides sensation to the thumb, index, middle, and part of the ring finger. It also provides strength to the thumb muscles. To enter the hand, the nerve is situated in a small canal adjacent to the wrist bones called the carpal tunnel. Swelling along the nerve in this relatively small compartment leads to a variety of symptoms. The most common symptoms include numbness and tingling sensations in the thumb, index, middle, and ring fingers; weakness and aching of the thumb or forearm; pain that can wake a patient at night, among others. 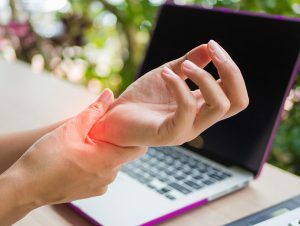 Although carpal tunnel syndrome is the most common cause of hand numbness and tingling, it can also be caused by nerve compression at other parts of the arm as well as in the neck. There are several factors that contribute to increased pressures in the carpal tunnel resulting in carpal tunnel syndrome. Some common occupational factors that contribute to carpal tunnel syndrome include use of hand-operated vibrating power tools, repetitive motions involved with bending the wrist, and keeping hands in a flexed position for extended periods of time. Some medical conditions are also associated with an increased risk for carpal tunnel syndrome. These include: diabetes mellitus, hypothyroidism, diabetes, obesity, and smoking. Evaluation for carpal tunnel syndrome begins with a thorough medical history that will include any medications you may be taking and a history of back or neck troubles. The physical exam will include certain simple maneuvers that will help in confirming the diagnosis of CTS. You may be referred to a neurologist or rehabilitation medicine physician for a specific study that evaluates the function of the nerves of your hand and forearm. The treatment of CTS is dependent on the severity and nature of the symptoms that a patient experiences. For minor symptoms, many patients can be treated by wearing a removable splint. In some cases, steroid injections into the carpal tunnel can be helpful in symptom relief. With this simple office procedure, a steroid solution is injected with a local anesthetic to decrease nerve inflammation and swelling. This treatment is not only therapeutic but also a good indicator that a patient’s hand pain and numbness is indeed carpal tunnel syndrome. The majority of patients experience near-resolution of their preoperative symptoms within the first 10-14 days following surgery. When non-invasive therapies fail to relieve symptoms, surgical treatment for carpal tunnel syndrome is indicated. Surgical treatment is called a carpal tunnel release. In this procedure, a small incision is made in the palm to expose the ligament of the wrist that overlies the median nerve. The ligament is then divided to relieve the pressure on the underlying median nerve. The incision is then closed with sutures that are usually removed approximately 10 days after surgery. A light dressing is applied over the incision that is removed after 2 days. Surgery is an outpatient procedure that usually takes approximately 30 minutes. Patients can resume personal activities of daily living immediately after surgery, and most patients can return to work after approximately 4 weeks, depending on their occupation. It may take longer time for symptoms to improve in patients with long-standing carpal tunnel syndrome. In rare patients, surgery does not relieve symptoms; however, surgery decreases the risk of further nerve damage. If you think you may have carpal tunnel syndrome, schedule a consultation with Dr. Zemmel today. Another cause of hand weakness and finger numbness is caused by compression of the ulnar nerve. The ulnar nerve is the nerve that provides sensation to the ring and little fingers and controls the movements of the small muscles of the hand that open and close the fingers. The ulnar nerve originates from the spinal cord in the neck and then travels down the arm through a small canal in the inner aspect of the elbow (the cubital tunnel). It then passes into the forearm and travels down through another canal in the wrist (Guyon’s canal). The nerve then enters the palm, and it branches to the muscles and fingers. Symptoms of ulnar nerve compression include numbness and tingling in the ring and little fingers of the affected hand. In more severe cases, patients may complain of hand weakness and clumsiness. The most common site of ulnar nerve compression occurs at the cubital tunnel in the elbow. Cubital tunnel syndrome is the second most common nerve compression syndrome in the upper extremity. Causes of cubital tunnel syndrome include repetitive elbow flexion, post-traumatic scarring, direct compression, or abnormal muscle anatomy surrounding the nerve. The diagnosis of cubital tunnel syndrome is typically based on a combination of history and physical findings. Part of the evaluation of cubital tunnel syndrome may include a nerve conduction study; however, this test can sometimes be negative. Cubital tunnel syndrome can be treated with nonsurgical and surgical approaches. Nonoperative treatments include behavioral changes that avoid long periods of elbow flexion, the use of elbow padding, and night splinting. Surgical treatment involves release of the nerve from its position in the cubital tunnel and placing it in a new position that minimizes tension over the nerve. Cubital tunnel release is performed as an outpatient procedure. After surgery the arm is wrapped in a mild compression dressing for the first 7-10 days. Most patients can resume normal activities about 6 weeks after surgery. In most cases, the numbness and tingling experienced preoperatively resolves in approximately 3-6 weeks. In cases of severe nerve damage, symptoms may never recover completely, but release will prevent worsening of symptoms. Compression of the ulnar nerve at the wrist is less common than at the elbow. It is frequently discovered as part of a workup for carpal tunnel syndrome. Causes of compression at Guyon’s canal include acute or repetitive trauma, previous wrist fractures, abnormal anatomy of adjacent muscles, and tumors such as cysts. Nonoperative treatment for cases associated with trauma include splinting for several weeks. Surgical treatment involves release of the nerve from its position in Guyon’s canal. Surgical nerve release is typically accomplished through the same incision used for a carpal tunnel release; both can usually be performed at the same time. The recovery of this procedure is very similar to a carpal tunnel release. If you think you think you may have cubital tunnel syndrome, please contact Richmond Aesthetic Surgery for an evaluation today. Ganglion cysts are the most common soft tissue tumors of the hand. Ganglion cysts are nodular collections of a thick gel-like fluid that typically occur at the wrist, palm and finger joints. The cause of these nodules is usually due to abnormal growth in either the lining of underlying joints or tendon sheaths; although, they can also develop due to previous trauma or inflammation. Surgical treatment usually involves outpatient excision of the nodules. These are nodules that commonly develop in the digits as a result of implantation of skin cells into the soft tissue or bone, usually as a result of minor trauma. The skin cells slowly grow over time and form painless swellings that can sometimes be mistaken for ganglion cysts. If left untreated, these cysts can occasionally compress bone, resulting in weakening of the affected bone. Foreign bodies, such as metal shards, glass, work glove fibers, and wood, left in the hand or digits will often develop a surrounding ball of scar as part of the normal healing process. The result is a tumor of the hand or finger that can become increasingly more painful. Lipomas are non-cancerous tumors comprised of fatty tissue that are commonly seen in the wrist and palm. As they enlarge, they may become more painful, especially if they compress underlying nerves of the hand. Giant cell tumors are the second most common of the hand (after ganglions). Giant cell tumors typically arise from the tendon sheaths and commonly involve the distal finger joints. Although they are non-cancerous tumors, they are associated with a 30% chance of recurrence. Schwannomas are the most common benign tumor arising from nerves in the upper extremity. They commonly form along the palm side of the hand or forearm. Excision hand lumps and bumps can usually be performed in the outpatient setting. Due to its constant sun exposure, the hand is a common location for skin cancers. The most common types of skin cancers are squamous cell carcinoma, basal cell carcinoma, and melanoma. Excision of skin cancers from the hand is a relatively simple procedure, depending on the size of the lesion. However, due to the anatomy of the hand, closure of defects following a cancer excision usually requires reconstruction with a skin flap or skin graft. In most cases, the incisions are dressed with a soft dressing that can be removed 2-3 days after surgery, and sutures are typically removed after approximately 10-14 days. If you have a tumor of the hand that you are concerned with, please contact our office for a consultation. Dupuytren’s Contracture is the result of fibrous thickening of the soft tissue layers deep to the skin of the palm. The cause of this abnormal thickening is unknown; however, it is commonly seen in males, aged 50 and older, and often of a Northern European or Scandinavian background. Dupuytren’s disease typically presents as firm nodules of the palm that gradually enlarge over time to form thickened cords. As these cords progress they can extend to the digits and cause gradual contracture of the hand. With worsening of the contracture, limitations of hand function increase, often resulting in an inability to completely open the hand. There are a variety of non-surgical and surgical treatments for Dupuytren’s Disease. In certain cases, cords can be divided under a local anesthetic in an office setting through a procedure called a needle aponeurectomy. In this procedure, under local anesthetic, the fibrous cord can be carefully divided using a fine needle, thus avoiding a more involved surgical excision. A newer minimally invasive technique involves use of a medicine that is designed to disrupt the fibrous cords causing contractures. In the office setting, Xiaflex®, which contains an enzyme that disrupts collagen, is injected into the cord, and the hand is gently manipulated to disrupt the area of contracture. In more advanced cases or in cases not amenable to non-surgical treatment, surgical release of Dupuytren’s contracture is necessary. Surgery is usually done in the outpatient setting, and it involves the use of numerous zig-zag incisions of the palm and fingers to expose the underlying palmar cords and nodules. Through these incisions, the cords and nodules are removed. Following closure of the incisions, the hand is placed in a soft dressing. Sutures are usually removed approximately 10-14 days after surgery, and patients frequently require hand therapy to regain hand strength and range of motion. There is no cure for Dupuytren’s disease; despite a good surgical outcome, a contracture can recur. A trigger finger is a painful condition of the hand caused by gradual thickening of the sheath surrounding the tendons of the hand. This tendon sheath thickening is usually due to inflammation and may also be associated with an inflammatory nodule. As a result of the inflammation, a patient may experience a digit “catching” or “popping” when opening or closing the hand. Occasionally, symptoms progress to the point where a patient may need to physically open or close the hand to overcome the triggering. When identified early, trigger fingers can be treated with a combination of splinting, non-steroidal anti-inflammatories, and rest. In some cases, a steroid injection into the affected tendon sheath can decrease tendon swelling, resulting in relief from the popping sensations. When non-surgical methods are unsuccessful, surgical release of the tendon sheath can open the tendon sheath and, therefore, relieve the triggering. Surgical release is usually performed as an outpatient procedure. Life is full of uncertainty, and unfortunately, accidents can happen. Injuries to the hand and digits can have potentially devastating impact to a patient’s daily life and occupation. Care of these injuries requires a team-like approach for the best results. Care begins with prompt evaluation of the injury, meticulous care of the involved soft tissue and bones, and repair of the injured structures. In the cases of hand fractures, bones are set with either pins or small plates. Injuries to tendons require strong repairs that will allow a return to motion shortly after surgery to avoid joint stiffness. Any nerve injuries usually require microsurgical repair under an operative microscope to increase the likelihood of successful return of function. Injuries to the fingertips may require local skin flaps to close defects while maintaining finger length. Occasionally, extensive fingertip injuries require amputation for proper management. Following surgical repair of injuries, the real work begins. Successful outcomes require active involvement and compliance of the patient in a hand rehabilitation program. The rehabilitation program will be designed by your surgeon and a trained hand therapist to guide you through your recovery. It is very important to follow all instructions carefully and comply with the recommendations of your therapist. Board-certified plastic surgeon Dr. Zemmel of Richmond Aesthetic Surgery has considerable experience in the management of difficult hand injuries. Our surgeon service many of the emergency departments of the Richmond metro area. If you have injured your hand, you can contact the physician on call to help coordinate your care with the nearest emergency room. Call (804) 464-3801, 24 hrs per day, 7 days per week.